This ceramic Christmas Tree is called Turtle Doves. 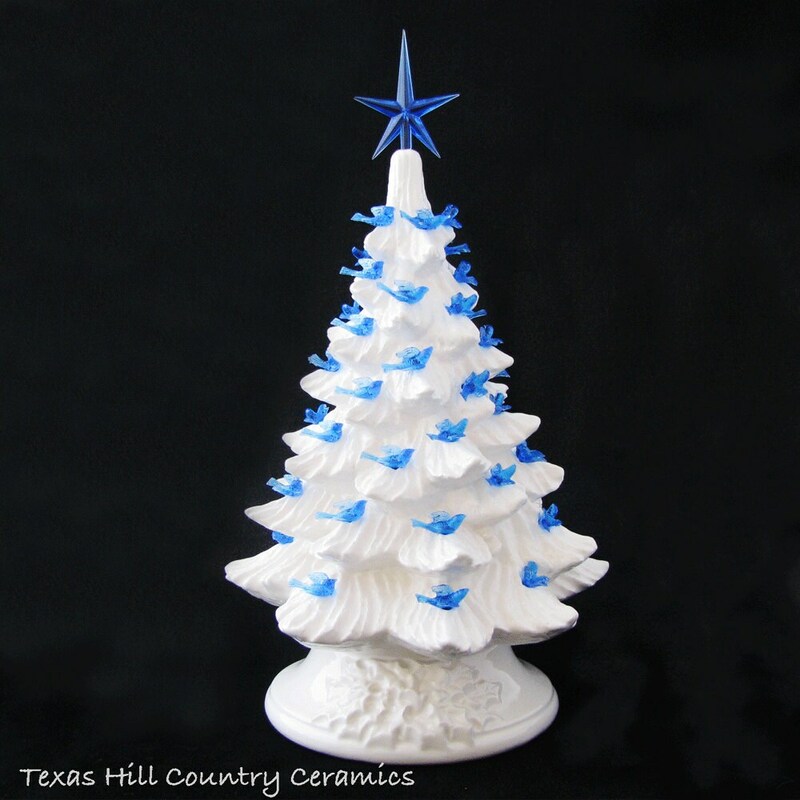 This tabletop ceramic Christmas tree is finished in warm winter white glaze with blue dove lights, it is a great way to help celebrate the holiday season. The total height of this tree (including the base, tree section and star) is approximately 11 1/2 inches. This is a brand new tree but made from a vintage mold dated 1986. The tree is decorate with blue dove bird lights and a blue star to match. This tree is made in my studio located in central Texas. Made to Order, see processing time needed in the Shipping Section. 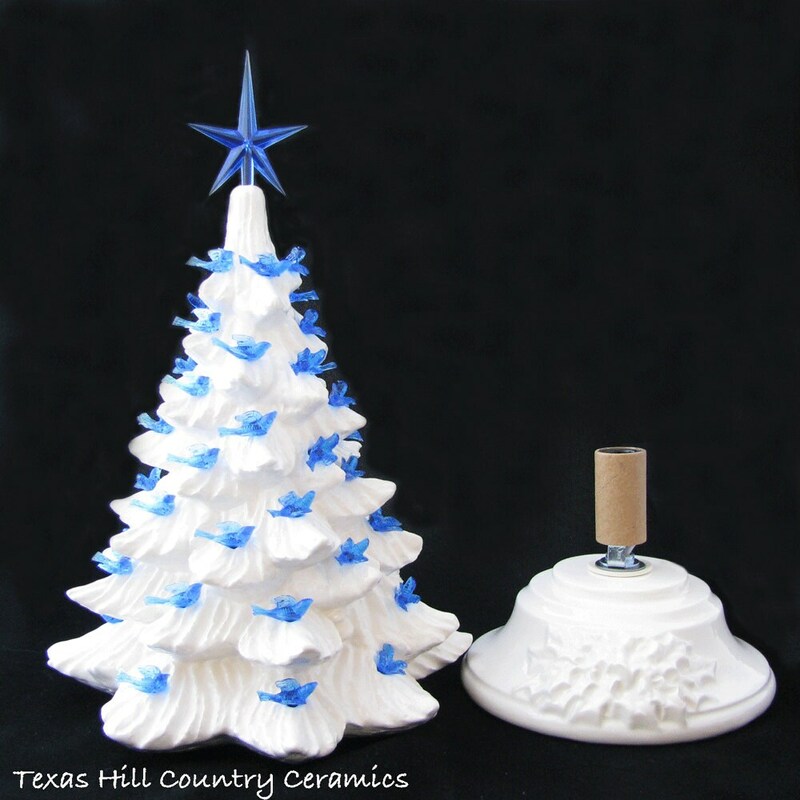 This ceramic Christmas tree and base is made of kiln fired ceramics and finished in lead free milk glass glaze. The ceramic base has a double holly leaf design on the front. This tree consists of two separate pieces - the tree section rests on the base so it is a snap to set up and take down. The ceramic base is wired with a permanent UL approved light fixture. On the cord is a rotating dial type switch so you can leave it plugged in and switch your tree on whenever you want. A steady burning 15 watt light bulb is included with the tree. This tree will arrive ready for you to decorate, due to the fragility of the birds they will be sent with the tree and you will need to insert them in the holes. I'm afraid if I ship the tree with the birds added many will arrive broken. Enough blue birds will be sent to decorate the tree, plus a few extra birds will be included. • The tree is glazed in a non toxic food safe milk glass white glaze. • The base of the tree is in the same white glaze. • Blue dove bird lights that glow when lit. • Modern style star in blue. • UL approved electrical fixture. • 15 watt light bulb. This is really a very pretty tree, I love it, just the color I wanted. It will great for Christmas. We had a very long wait.